Easy Support System You’ve Been Searching For!! 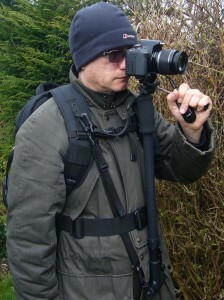 EZ Mount Mono pods are a new and unique type of Support Systems accessories which are used during shooting or photography, supplied as a Shoulder Harness (SH), an adjustable Tactical Vest (TV), Hunters Jackets (HJ), Ruck Sack (RS) or Camera Ruck Sack (CRS), which attach to an adjustable mono pod to make up the EZ Mount Mono pod as shown in the photos. 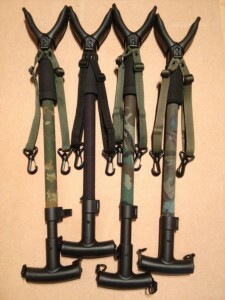 It is primarily designed to replace any existing mono pod/bi-pod or shooting stick; these unique Shooting Support Systems can support the weight of any rifle during field target shooting or hunting and securely hold the rifle steady in shooting position and can improve accuracy and increase your range. 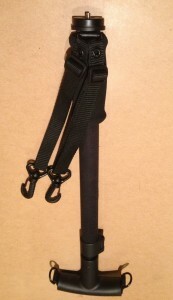 It is perfect for all types of hunting and suitable for shooters or hunters who may need help to hold and support a heavy rifle. It is also perfect for field target shooters, all hunters, farmers, gamekeepers, pest controllers, etc. These hunting mono pods are fully tested and are suitable to be used with all types of airguns (PCP and Springer’s), shotguns and rim fire rifles. It was reviewed by Air gun magazine last year. The adjustable mono pod (91 cm) can be detached and used as a shooting stick or rest on its own in kneeling/sitting position if required. These unique Camera Support Systems attach to any type of camera and are designed to replace any existing mono pod or tripod, They are designed to support the weight of the camera and all accessories and securely hold it steady while taking photos indoors or outdoors. It is perfect for wildlife and sport photography, reporters, journalists, and even people going on safari, who have to carry their cameras with heavy telephoto zoom lenses, tripods and other accessories, as shown in the photos. These mono pods are available with or without a 2 way head. The two way head cannot be removed from the mono pod. Please read the benchmark review about these unique Photography Mono pods by Amateur Photographer Magazine. All six models are available in different colours and camouflage patterns. 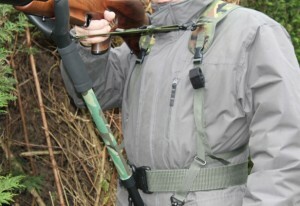 Adjustable mono pods for hunting are available in 5 different camouflage patterns and colours. 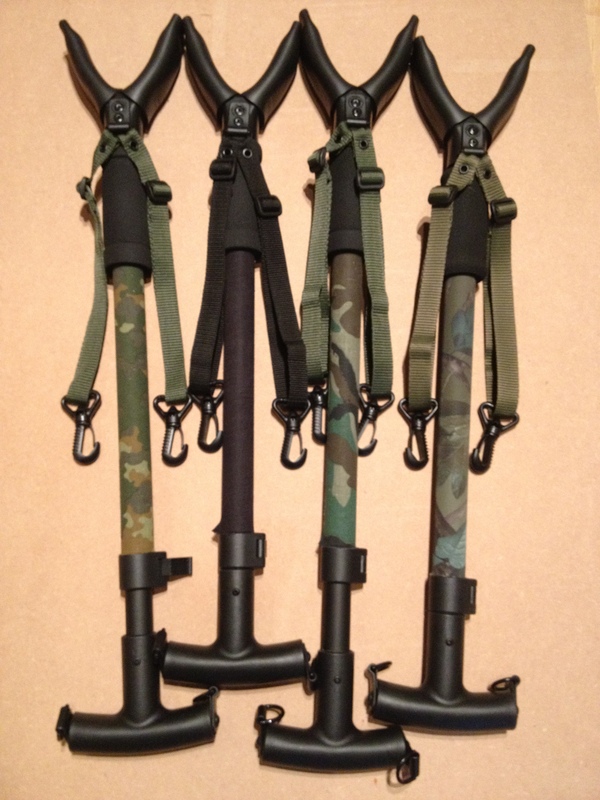 The Hunting/Shooting Version of Adjustable Mono pods attach to a Light Weight Shoulder Harness, a Tactical Vest, Hunters Jacket or a Ruck Sack to make up the EZ Mount Mono pods. Mono pods are not available to buy as a separate unit. 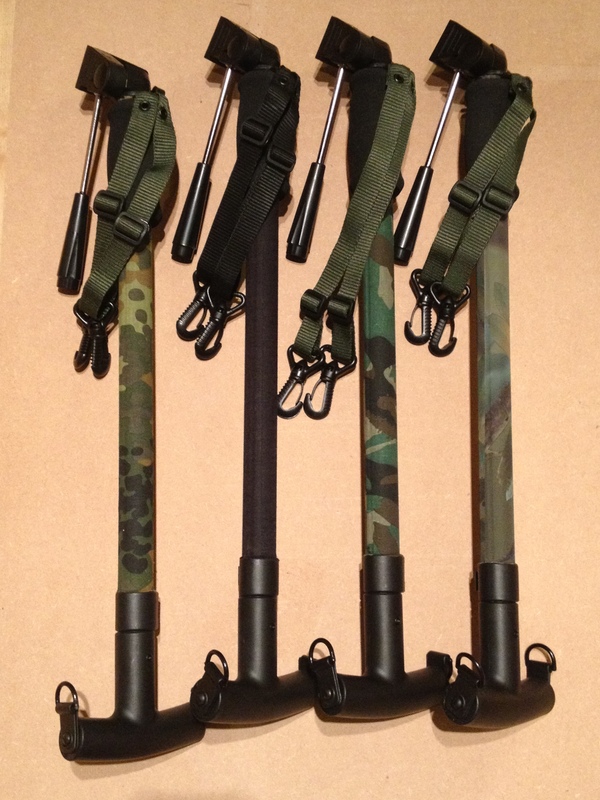 These mono pods are available in different Camo patterns, and the “V” mount where the rifle rests is fully padded to protect the rifle stock. The Camera Version of Adjustable Mono pods attach to a Light Weight Shoulder Harness, a Tactical Vest, a Rucksack or a Camera Rucksack to make up the EZ Mount Mono pods. The Mono pods are not available on their own, and the two way head cannot be removed. 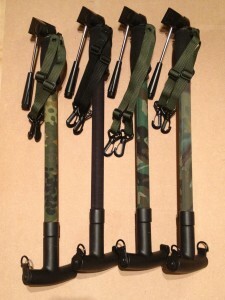 They are available in different Camo patterns as shown in the photo. There are now two Adjustable Mono pod models available for Photography Version, a standard adjustable mono pod with 2 way-head and a new Adjustable Mono pod without the 2 way-head as shown in the photo below. We as the seller (EZ Field Ltd) accept no responsibility or liability for any injury or any damage to any equipment’s caused by using or wearing these Mono pods. It is the responsibly of you the buyer to make sure that these mono pods are safe to use and wear at all times.